Below is a list of best San Diego downtown hotels. Many are located within steps of the Gaslamp Quarter and within a short drive to the San Diego Zoo as well as Balboa Park. If you like historical buildings then the Courtyard San Diego Downtown is ideal. The Manchester Grand Hyatt San Diego boasts a resort-style atmosphere for families and other family friendly places include the Westin San Diego or try the Kimpton Solamar Hotel. 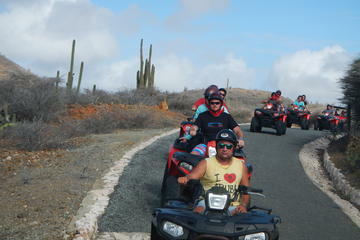 If you are a young adult looking for a lively atmosphere try the Hard Rock Hotel San Diego or the Westgate Hotel. When you are attending an event at Petco Park then the adjoining Omni San Diego Hotel is perfect. When you are looking for family value then the Best Western Plus Bayside Inn or Residence Inn San Diego Downtown/Gaslamp Quarter are superb. When you are looking for an upscale San Diego downtown hotel that is perfect a romantic getaway and is close to several major attractions then the Courtyard San Diego Downtown is a perfect choice. Located 1-block north of the Gaslamp Quarter, the Courtyard San Diego Downtown is situated within a 10-minute drive of the San Diego Zoo as well as Balboa Park and Coronado Beach is only 15-minutes away. The Courtyard San Diego Downtown was originally constructed as a bank in 1928 and many of the historical features remain. The building is fifteen stories with Romanesque Revival features on the interior as well as the exterior. The Courtyard San Diego Downtown contains 245 rooms as well as suites which were renovated in 2013 and boast an Art Deco decor. Guest rooms range in size from 230 to 376 square feet with a choice of bedding, microwave and refrigerator (small kitchenette) as well as views of the city or bay from large picture windows. Executive rooms have 388 square feet with an integrated sleeping/living area with sofa sleeper, small kitchenette and views of the city from large windows. One-bedroom suites have a separate living room, small kitchenette and views of the skyline. The one-bedroom Presidential suite has a separate living room, small kitchenette, 1.5-bathrooms and a private balcony with views of the San Diego Bay. The Courtyard San Diego downtown hotel is ideally placed for easy access to several major attractions such as the Waterfront Park, Petco Park and Old Town. The Courtyard San Diego Downtown has a fitness center and a billiards room but no freshwater swimming pool onsite. Dining onsite includes the Lobby which serves all three meals. Numerous offsite dining options within walking distance exist such as Rei Do Gado Brazilian Steak House, Brian’s 24 and Cafe 21. Nightlife is superb in the Gaslamp Quarter with the Dinner Detective San Diego, House of Blues and the American Comedy Club within walking distance. When you are searching for an upscale waterfront resort-style San Diego downtown hotel with numerous onsite amenities and is great for families then you should stay at the Manchester Grand Hyatt San Diego. Located in the Marina District between the Gaslamp Quarter and the San Diego Bay, the Manchester Grand Hyatt San Diego downtown hotel is situated across the street from Seaport Village and is within a 5-minute walk to the San Diego Convention Center. The Manchester Grand Hyatt San Diego has a modern forty story architectural design with 1,628 rooms and suites which sport a contemporary decor. There are two levels of service which include the Grand Club with upgraded amenities such as a private lounge serving complimentary breakfast, evening cocktails and appetizers. Guest rooms are sized at 340 square feet with a choice of bedding, bay window seating, floor to ceiling windows and views of the city skyline or the bay. Deluxe rooms are corner units with 380 square feet that features bay window seating, floor to ceiling windows and views of the city as well as the bay. Sofa Bed Studios have 700 square feet with only a queen size sofa sleeper within an integrated living area, floor to ceiling windows and views of the skyline as well as bay. One-bedroom suites range in size from 700 to 1,450 square feet with a choice of bedding, a separate living room, dining area, floor to ceiling windows and views of the city as well as the San Diego Bay. The Manchester Grand Hyatt San Diego downtown hotel has a great spot to start your explorations with stellar attractions like the San Diego Bay Walk, the U.S.S. Midway Museum and the Maritime Museum of San Diego are all within walking distance. The Manchester Grand Hyatt San Diego offers a children’s club to help keep you little ones busy with activities. The hotel has a resort-style atmosphere with two rooftop freshwater swimming pools including an adults-only pool, a fitness center, tennis courts, children’s club, shopping boutiques and a full service spa onsite. Onsite dining includes Market One for 24/7 grab-n-go style food; the Seaview Breakfast Buffet Restaurant; Sally’s Fish House and Bar; a seasonal pool bar and grill; Redfield’s Sports Bar and the Top of the Hyatt which is located on the 40th floor with spectacular views of the bay as well as city skyline. Offsite dining options can be found within an easy walk at Seasons 52, Puesto Mexican Street Food and Eddie V’s Prime Seafood. For nightlife take a short stroll to the Gaslamp Quarter where you will find the Shout House, the Field Irish Pub and Prohibition San Diego. When you are seeking a trendy upscale San Diego downtown hotel that has a lively atmosphere and is perfect for young adults, then the Hard Rock Hotel San Diego is a superb selection. 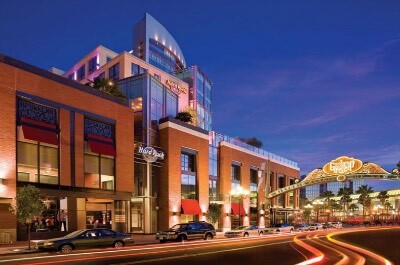 Located on the southern edge of the Gaslamp Quarter, the Hard Rock Hotel San Diego is situated within a 5-minute walk to Petco Park as well as to the San Diego Convention Center and is a 10-minute walk to Seaport Village. The Hard Rock San Diego downtown hotel has a modern twelve story architectural style with 420 rooms and suites that boast a chic rock-n-roll memorabilia decor. Studios are sized at 312 square feet with a choice of bedding, floor to ceiling windows and a city view. The Float Studio is slightly larger with an expansive terrace that features views of the city. The Rock Star suites have various floorplans and range from 610 to 1,200 square feet with one-bedroom, a separate living room and floor to ceiling windows. The Debut suite is the smallest; Silver Rock Star suites range in size from 610 to 665 square feet and a private terrace that features views of the Gaslamp Quarter or San Diego Bay. Gold Rock Star suites have 655 to 740 square feet of space and a private terrace that features expansive views of the skyline or San Diego Bay. The Platinum rock Star suite ranges in size from 670 to 850 square feet with an indoor/outdoor fireplace and a 270 to 300 square foot terrace with huge views of the Gaslamp Quarter or San Diego Bay. Multi-Platinum suites are sized between 984 to 1,070 square feet with an outdoor terrace up to 835 square feet in size that features views of Coronado Island. Diamond Rock Star suites are 1,200 square feet with a 490 square foot wraparound terrace that features a Jacuzzi and views of the bay, Coronado Island and the city skyline. The Hard Rock Hotel San Diego is perfectly located for fun with many of the stellar attractions like the Embarcadero Marina Park South, Old Town and Balboa Park are all within 10-minutes by foot or by car. The Hard Rock San Diego downtown hotel offers complimentary Electra bicycles for those who choose to explore the city this way. The hotel has a lively rooftop freshwater swimming pool with a superb sundeck, a fitness center, shopping boutique and a full service spa as well as free music downloads throughout your stay. Dining at the Hard Rock Hotel San Diego features Maryjane’s for all three meals (happy hour starts at 4:20) and Nobu prepares Japanese cuisine. There is a plethora of dining choices in the Gaslamp Quarter which includes the Tin Fish, Meze Greek Fusion and Rockin’ Baja Coastal Cantina. Nightlife at the Hard Rock Hotel San Diego is very lively with DJ’s at the rooftop bar called Float and 207 features DJ’s on selected evenings. When you are searching for an upscale San Diego downtown hotel that is perfect for all types of travelers and within close proximity to many outstanding attractions then the Westin San Diego is an ideal selection. 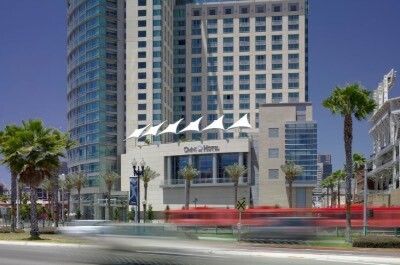 Located between the San Diego Bay and the Gaslamp Quarter in downtown, the Westin San Diego is situated within a 10-minute drive to the San Diego Zoo and Balboa Park as well as the San Diego Convention Center. 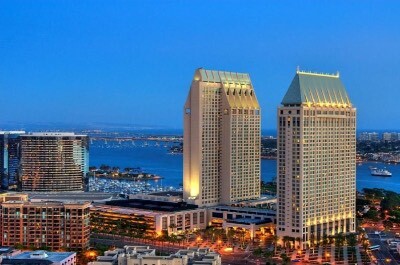 The Westin San Diego has a modern twenty six story architectural design with 436 rooms as well as suites that were renovated in 2014 and feature a contemporary decor. Traditional rooms range in size from 255 to 390 square feet with a choice of bedding and views of the city. Deluxe rooms are between 275 to 350 square feet with a choice of bedding and views of the San Diego Bay. Junior suites are 560 square in size with a choice of bedding, a separate sitting area (sofa sleeper), 1.5-bathrooms and views of the city or bay. The one-bedroom Bi-level suite is sized at 730 square feet with a separate living room (sofa sleeper), loft-style bedroom, 1.5-bathrooms and views of the skyline as well as the San Diego Bay. The one-bedroom Terrace suite is 725 square feet with a separate living room (sofa sleeper), 1.5-bathrooms, dining area, wet bar and views of the city as well as the bay. One-bedroom Luxury suites are sized at 930 square feet with a separate living room (sofa sleeper), a full bar and views of the skyline as well as bay. Presidential suites have 2,000 square feet with two-bedrooms, separate living room, dining room, 2.5-bathrooms, kitchenette and panoramic views of the city skyline as well as San Diego Bay. The Westin San Diego downtown hotel is a superb place to begin your explorations of the area with several attractions within walking distance such as the Seaport Village, the Museum of Contemporary Art-Downtown, Maritime Museum of San Diego and the San Diego Bay Walk as well as Little Italy. 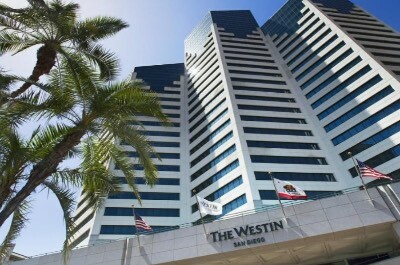 The Westin San Diego has a super rooftop freshwater swimming pool with sundeck, a fitness center and in-room massages. Dining options onsite include the Coast for breakfast and lunch as well as the Bar serves continuously from midday to midnight. Dining options offsite within a short stroll from the hotel include Currant American Brasserie, Tender Greens and Seasons 52 prepares American cuisine. Nightlife in the area includes a trip to the Karl Strauss’ Old Columbia Brewery and Grill for a pub atmosphere, the San Diego Civic Center for live performances and the House of Blues has live music. When you are looking for an upper-mid-range San Diego downtown hotel that is just minutes from many stellar attractions and is family-friendly then the Omni San Diego Hotel is a superb choice. 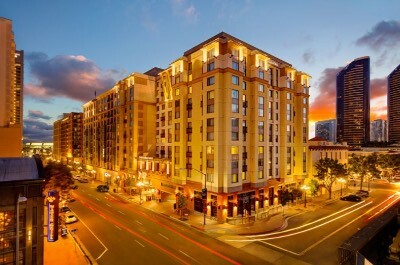 Located directly in the Gaslamp Quarter and connected directly to Petco Park via a sky bridge, the Omni San Diego Hotel is situated within a 5-minute walk to the San Diego Convention Center and only a 10-minute drive to Old Town. The Omni San Diego downtown hotel has a modern twenty one story architectural style with 511 rooms and suite that feature a contemporary decor. Deluxe rooms have 360 square feet with a choice of bedding, floor to ceiling windows and views of the Gaslamp Quarter or downtown. Premier rooms are located on higher floors with similar square footage, a choice of bedding, floor to ceiling windows and a view of the bay or city skyline. One-bedroom Executive suites are sized at 520 square feet that feature a separate living room with a sofa sleeper, floor to ceiling windows and a view of the Coronado Bridge or San Diego Bay. One-bedroom suites have 640 square feet which contain a separate living room with a sofa sleeper, floor to ceiling windows and views of Petco Park. Studio suites are sized at 650 square feet with a separate living room and sofa sleeper, floor to ceiling windows, wet bar and terrace that overlooks the pool area. The Tony Gwinn suites has 1,600 square feet with a separate living room, floor to ceiling windows, kitchenette, wet bar and a private terrace that overlooks the San Diego Bay. The one-bedroom Jimmy Carter Presidential suite is spacious at 2,200 square feet with a separate living room, kitchenette, floor to ceiling windows, wet bar and two balconies that boast views of the San Diego Bay as well as city skyline. The Omni San Diego Hotel has a superb location to start you adventures of the area with major attractions such as the New Children’s Museum, Embarcadero Marina Park South and the Coronado Ferry within walking distance. The Omni San Diego Hotel offers a special children’s backpack upon check-in to help make the kids feel special. 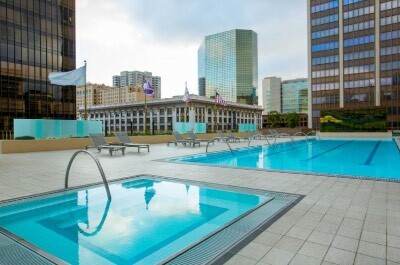 The Omni San Diego downtown hotel has a fantastic rooftop freshwater swimming pool with a sundeck that features a fireplace; a fitness center and in-room massage services. Dining at the Omni San Diego Hotel features a McCormick and Schmick’s Seafood Restaurant for all three meals as well as the Palm Terrace and Pool Bar is open for lunch. Offsite dining choices are numerous with Lou and Mickey’s for steaks, the Tin Fish prepares seafood and Cafe Sevilla of San Diego serves Latin cuisine. Nightlife includes live entertainment onsite at Zumbido or you can walk to the Dublin Square Irish Pub and Grill and Moonshine Flats. When you are seeking a value oriented San Diego downtown hotel that is good for all types of travelers and close to the harbor then the Best Western Plus Bayside Inn is a great selection. Located between Little Italy and the Gaslamp Quarter just 4-blocks from the harbor, the Best Western Plus Bayside Inn is situated within a 10-minute walk to the Maritime Museum of San Diego and less than a 30-minute walk to Balboa Park. The Best Western Plus Bayside Inn has a modern thirteen story architectural design with 120 rooms that feature a contemporary decor. Guest rooms are sized at 323 square feet with a microwave and refrigerator, a choice of bedding, floor to ceiling windows and a private Juliet balcony that boasts views of the bay, pool or the city. The Best Western Plus Bayside Inn is a perfect to begin your explorations of the area with several top attractions within a short drive such as the San Diego Zoo, the San Diego Air and Space Museum inside Balboa Park as well as Coronado Island and you can walk to the Museum of Contemporary Art-Downtown or the Waterfront Park. The Best Western Plus Bayside Inn San Diego downtown hotel has a freshwater swimming pool with deck, a fitness center as well as a free shuttle to the airport, Amtrak station and the cruise ship terminal. 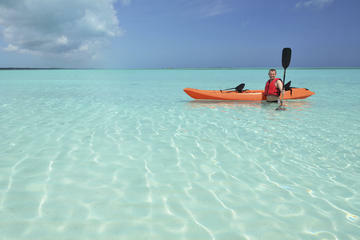 Dining includes a complimentary breakfast and the Bayside Bar and Grill serves lunch as well as dinner. Offsite dining selections within walking distance are plentiful with Queenstown Public House, Pappalecco prepares Italian and the Karl Strauss Brewery and Restaurant offers American fare. 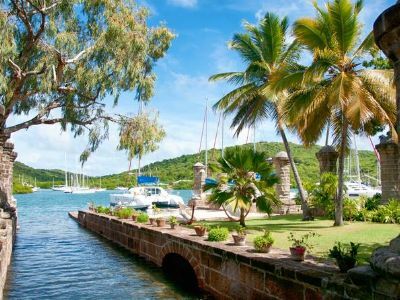 Nightlife within walking distance to the hotel is plentiful with the Music Box for live music, False Idol has a nightclub atmosphere as well as the Waterfront Bar and Grill is great for sunsets. When you are looking for a luxury San Diego downtown hotel that is perfect for couples and travelers with small children then the Westgate Hotel is a superb choice. Located less than 3-blocks from the northern edge of the Gaslamp Quarter in downtown, the Westgate is situated within a 10-minute drive to Balboa Park as well as the San Diego Zoo. The Westgate Hotel has a modern nineteen story architectural style with 223 rooms and suites that boast an Old World European decor. Deluxe rooms have 400 square feet with a choice of bedding, floor to ceiling windows and small Juliet balcony with city views. Premier rooms are sized similar with a choice of bedding, floor to ceiling windows and a small Juliet balcony that boasts views of the skyline, the bay front or Balboa Park. The one-bedroom Executive suite is spacious with a separate living room, floor to ceiling windows and a Juliet balcony that sports panoramic views of the Pacific Ocean and Coronado Island. The one-bedroom Royal is larger with a separate living room, floor to ceiling windows and a Juliet balcony with views of the harbor or Pacific Ocean. The two-bedroom Governor’s suite is massive with a separate living room, 2-bathrooms, a full kitchen, floor to ceiling windows and a Juliet balcony that features a skyline view. The one-bedroom Presidential suite has 1,500 square feet with a separate living room, a full kitchen, floor to ceiling windows and a Juliet balcony that offers views of the harbor, Coronado Bridge and the city skyline. The Westgate San Diego downtown hotel has a superb location to start your adventures from with several major attractions within a short walking distance such as Little Italy, Seaport Village and the Gaslamp Museum at the Davis-Horton House. The Westgate Hotel has a great rooftop freshwater swimming pool with a sundeck that overlooks the city skyline, a fitness center, flower boutique, barber shop and a full service spa onsite. Dining at the Westgate Hotel includes the Westgate Room for all three meals including a Sunday brunch. There is a Gourmet wine and Delicatessen which is open for lunch as well as the Plaza Bar which serves appetizers while you listen to the live piano music. Offsite dining selections within an easy walk from this San Diego downtown hotel include Spike Africa’s Fresh Fish Grill and Bar, Rei Do Gado Brazilian Steak House and Cafe 21 serves American style cuisine. Nightlife is plentiful in the Gaslamp Quarter area with the San Diego Civic Theatre, House of Blues for live music and the Dinner Detective Show. When you are searching for a value oriented mid-range San Diego downtown hotel that is family-friendly and close to many of the outstanding attractions then the Residence Inn San Diego Downtown/Gaslamp Quarter is a perfect choice. Located in the heart of the Gaslamp Quarter in downtown, the Residence Inn San Diego Downtown/Gaslamp Quarter is situated just 2-block from the San Diego Convention Center and only a 10-minute drive to Balboa Park as well as the San Diego Zoo. 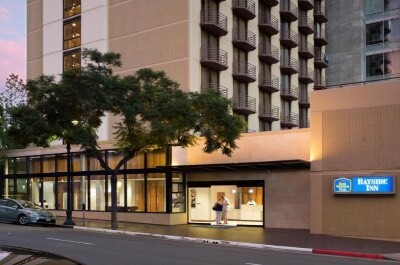 The Residence Inn San Diego Downtown/Gaslamp Quarter has a modern fourteen story architectural design with 240 suites that feature a contemporary decor. Studios are sized at 400 square feet with an integrated sleeping/living area (most have sofa sleepers), a choice of bedding, a full kitchen and views of the city. One-bedroom suites range in size from 500 to 600 square feet which contains a separate living room with sofa sleeper, a full kitchen and views of the city. The Residence Inn San Diego Downtown/Gaslamp Quarter has a solid location for exploring the area with outstanding attractions like the New Children’s Museum, the Firehouse Museum and Seaport Village are all within a 20-minute walk from the hotel. When you want to get close to the Pacific Ocean you are within 1-mile to the Coronado Island Ferry, Coronado Beach and the San Diego Bay Walk. The Residence Inn San Diego downtown hotel /Gaslamp Quarter has a freshwater swimming pool with a sundeck and a fitness center onsite. Dining begins with a complimentary breakfast daily and you can save money with in-room cooked meals as well as the onsite Bar Vie which serves light fare. 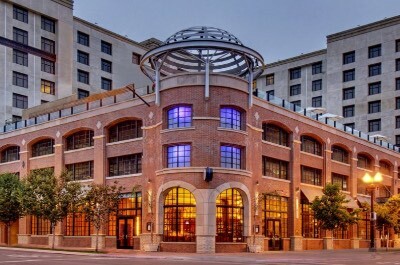 Dining options within walking distance include Meze Mediterranean Cuisine, the Water Grill for seafood and the Blind Burro serves Mexican dishes. Nightlife is plentiful in the Gaslamp Quarter with Altitude Sky Lounge, the FLUXX and Patrick’s II has live music. When you are seeking an upscale boutique style San Diego downtown hotel that is perfect for all types of travelers including families then the Kimpton Solamar Hotel is an ideal selection. Located where the East Village meets the trendy Gaslamp Quarter, the Kimpton Solamar Hotel is situated 2-blocks from the San Diego Convention Center as well as Petco Park and is only a 10-minute drive to the San Diego Zoo. The Kimpton Solamar Hotel has a modern ten story architectural style with 235 rooms and suites which feature a chic decor. Deluxe and Skyline Deluxe rooms are sized at 340 square feet with a choice of bedding (king size beds offer a corner sofa) as well as views of the surrounding area or the city skyline. Spa and Spa Corner rooms have 420 square feet with an oversized soaking tub and offer views of the surrounding area. The one-bedroom Virtuoso and Master suites are corner units that range in size from 450 to 570 square feet which contains a separate living room with sofa sleeper and views of the city. The one-bedroom Luna suite is sized at 725 square feet with an integrated sleeping/living area, wet bar and a private patio with views of the city. The Kimpton Solamar San Diego downtown hotel has a great location for exploring the area with several major attractions within a 20-minute walk such as the U.S.S. Midway Museum, Maritime Museum of San Diego as well as the San Diego Chinese Historical Museum and there are complimentary bicycles for use. If you are searching for the Pacific Ocean you will find the Embarcadero Marina Park South within a short walk 15-minute walk. The Kimpton Solamar Hotel has a great rooftop freshwater swimming pool with a nice sundeck that overlooks the skyline, a fitness center and in-room massages are available. 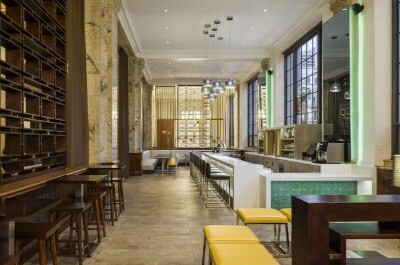 Dining at the Kimpton Solamar San Diego downtown hotel includes Jsix Restaurant which serves breakfast and dinner as well as a nice brunch on the weekends. Other dining options are plentiful in the Gaslamp Quarter where you will find barleymarsh which serves pub fare, La Puerta prepares Mexican cuisine and Blue Point Coastal Cuisine serves seafood. Nightlife is hopping onsite with a complimentary wine and beer hour at the rooftop Jlounge where you will find fire pits and within 2-block walking distance you can enjoy the Shout House, the Noble Experiment and the Cat Eye Club.